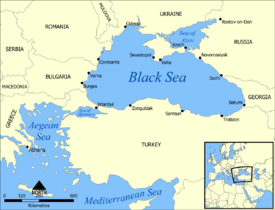 The Black Sea is an inland sea between southeastern Europe and the Anatolian peninsula (Turkey) and is ultimately connected to the Atlantic Ocean via the Mediterranean and Aegean Seas and various straits. 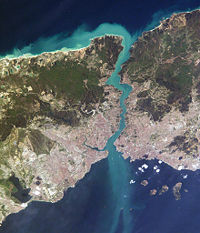 The Bosporus strait connects it to the Sea of Marmara, and the long, island-bound strait of the Dardanelles connects it to the Aegean Sea region of the Mediterranean. These waters separate eastern Europe and western Asia. To its east, the Kerch Strait links the Sea to the smaller Sea of Azov. The most important river entering the Black Sea is the Danube. 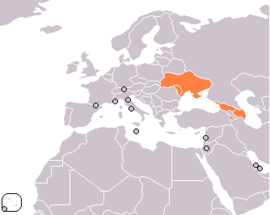 Countries bordering the Black Sea are Turkey to the south, Bulgaria and Romania to the west, Ukraine to the north, Russia to the northeast, and Georgia to the east. The Crimean Peninsula juts into the Black Sea from the north. The roughly oval-shaped body of water has a surface area of 163,000 square miles (422,000 square km). When the Sea of Azov is included, it covers approximately 178,000 square miles (461,000 square km). The Black Sea is a favorite of scientists, specifically because its lower levels are nearly biologically dead due to weak ventilation of its deep layers. Though the diversity of its sea-life is less than that of the ocean or more saline seas, it is unusual, beautiful, and intriguing. Considered in some ways more suitable for research, its sea ecology is more easily comprehensible to scientists. Its ecosystem responds quickly to external influences, both to natural occurrences, such as environmental factor fluctuations, or anthropogenic effects, such as fisheries, pollution, or industrialization in the surrounding area. Modern names of the Sea are equivalents of the English name, "Black Sea," including Greek Mavre Thalassa (Μαύρη Θάλασσα), Bulgarian Cherno more (Черно море), Georgian Shavi zghva (შავი ზღვა), Laz Ucha Zuğa, or simply Zuğa 'Sea', Romanian Marea Neagră, Russian Chyornoye more (Чёрное море), Turkish Karadeniz, Ukrainian Chorne more (Чорне море), Ubykh /ʃʷaʤa/. This name cannot be traced to an earlier date than the thirteenth century, but there are indications that it may be considerably older. Strabo's Geography (1.2.10) reports that in antiquity, the Black Sea was often simply called "the Sea" (ho pontos). For the most part, Graeco-Roman tradition refers to the Black Sea as the "Hospitable sea," Euxeinos Pontos (Εὔξεινος Πόντος). This is a euphemism replacing an earlier "Inhospitable sea," Pontos Axeinos., first attested in Pindar (early fifth century B.C.E., c. 475). Strabo (7.3.6) argues that the Black Sea was called "inhospitable" before Greek colonization because it was difficult to navigate, and because its shores were inhabited by savage tribes; and that the name was changed to "hospitable" after the Milesians had colonized, making it part of Greek civilization. It is also possible that the name Axeinos arose by popular etymology from an Iranian axšaina- "dark;" the designation "Black Sea" may thus date from Antiquity. The reason for the name may be an ancient assignment of colors to the direction of the compass—black referring to the north, and red referring to the south. Herodotus on one occasion uses Red Sea and Southern Sea interchangeably. Another possible explanation comes from the color of the Black Sea's deep waters. Being further north than the Mediterranean Sea and much less saline, the microalgae concentration is much richer, causing the dark color. Visibility in the Black Sea is on average approximately five meters (5.5 yd), as compared to up to thirty-five meters (38 yd) in the Mediterranean. 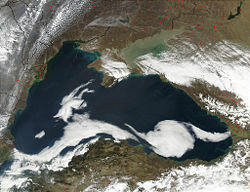 In naval science, the Black Sea is thought to have received its name because of its hydrogen sulfide layer that begins about 200 meters below the surface, and supports a unique microbial population which produces black sediments probably due to Anaerobic Methane oxidation. The Black Sea is a roughly oval-shaped body of water located in the southeastern extremity of Europe. It is connected to the Atlantic Ocean by the Bosporus Strait, the Sea of Marmara, the Dardanelles, the Aegean Sea, and the Mediterranean Sea. The surface area of the Sea proper is 163,000 square miles (422,000 square km). Including the small Sea of Azov, it covers approximately 178,000 square miles (461,000 square km). The Crimean Peninsula juts into the Black Sea from the north. To its east the Kerch Strait links the Sea to the smaller Sea of Azov. Other than that, the Sea's coastline is fairly regular. The maximum width is about 730 miles, while the shortest north-south distance is 160 miles. The northern and northwestern shores are furrowed by ravines, valleys, and rivers. The Greater and Lesser Caucasus ranges form the eastern shore, while the south is lined with the Pontic Mountains. Near the Bosporus outlet, the shoreline relief is moderate though still steep. Farther north, in the Burgaski Bay area, low mountains emerge where the Balkan Mountains of Bulgaria extend eastward. 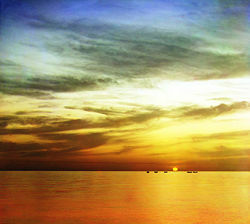 A flat plateau area along the northwestern shore gives way to the Danube River delta, which emerges into the sea. The Black Sea basin was formed during the Miocene orogenies which uplifted the mountain ranges and divided the ancient Tethys Ocean into several brackish basins, including the Sarmatic Sea. The Caspian, Azov, Aral, and Black Seas are the remnants of this evaporated basin. The basin is divided into two sub-basins by a convexity extending south from the Crimean peninsula. The northwest of the basin is characterized by a relatively large shelf up to 120 miles (190 km) wide, which has a relatively shallow apron with gradients between 1:40 and 1:1000. 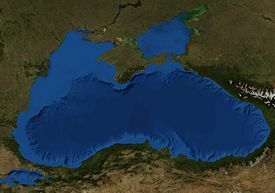 The southern edge around Turkey and the eastern edge around Georgia, however, are typified by a shelf that rarely exceeds 12 miles (20 km) in width and an apron that is typically 1:40 gradient with numerous submarine canyons and channel extensions. The Euxine abyssal plain in the center of the Black Sea reaches a maximum depth of 7240 feet (2206 m) just south of Yalta on the Crimean Peninsula. The basin is connected to the Mediterranean Sea via the Turkish Straits System (TSS) in the southwest, which includes the Bosporus and Dardanelles straits and the Sea of Marmara. The Black Sea is connected to the Sea of Azov in the northeast via the Kerch straits. 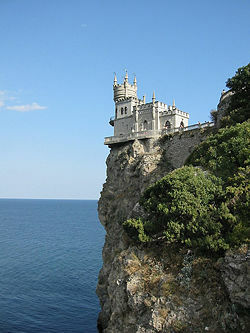 "Swallow's Nest Castle" in Yalta overlooking the Black Sea. The Black Sea is the world’s largest meromictic basin where the deep waters do not mix with the upper layers of water that receive oxygen from the atmosphere. As a result, over 90 percent of the deeper Black Sea volume is anoxic water. The current hydrochemical configuration is primarily controlled by basin topography and fluvial inputs, which result in a strongly stratified vertical structure and a positive water balance. The upper layers are generally cooler, less dense, and less salty than the deeper waters, as they are fed by large fluvial systems, whereas the deep waters originate from the warm, salty waters of the Mediterranean. This influx of dense water from Mediterranean is balanced by an outflow of fresher Black Sea surface-water into the Marmara Sea, maintaining the stratification and salinity levels. The surface water has an average salinity of 18 to 18.5 parts per thousand (compared to 30 to 40 for the oceans) and contains oxygen and other nutrients required to sustain biotic activity. These waters circulate in a basin-wide cyclonic shelfbreak gyre known as the Rim Current which transports water round the perimeter of the Black Sea. Within this feature, two smaller cyclonic gyres operate, occupying the eastern and western sectors of the basin. Outside the Rim Current, numerous quasi-permanent coastal eddies are formed due to upwelling around the coastal apron and "wind curl" mechanisms. The intra-annual strength of these features is controlled by seasonal atmospheric and fluvial variations. Sea Surface Temperature of the surface waters varies seasonally from 8 °C (46 °F) to 30 °C (86 °F). Directly beneath the surface waters the Cold Intermediate Layer (CIL) is found. This layer is composed of cool, salty surface waters, which are the result of localized atmospheric cooling and decreased fluvial input during the winter months. The production of this water is focused in the center of the major gyres and on the NW shelf and as the water is not dense enough to penetrate the deep waters, isopycnal advection occurs, dispersing the water across the entire basin. The base of the CIL is marked by a major thermocline, halocline, and pycnocline at ~100-200 m and this density disparity is the major cause of deep-water isolating. Below the pycnocline, salinity increases to between 22 and 22.5 ppt and temperatures rise to around 8.5 °C (47.3 °F). The hydrochemical environment shifts from oxygenated to anoxic, as bacterial decomposition of sunken biomass utilizes all of the free oxygen. Certain species of extremophile bacteria are capable of using sulfate (SO42−) in the oxidation of organic material, which leads to the creation of hydrogen sulfide (H2S). This enables the precipitation of sulfides such as iron-sulphides like pyrite, greigite and iron-monosulphide as well as the dissolution of carbonate matter such as Calcium carbonate (CaCO3) found in shells. Organic matter, including anthropogenic artefacts such as boat hulls, are well preserved. During periods of high surface productivity, short-lived algal blooms cause organic rich layer known as sapropels to occur. Scientists have reported an annual phytoplankton bloom that can be seen in many NASA images of the region. Another possible danger to those living near the Sea is the possibility of a small asteroid's impact into the Sea. Recently, modeling shows there is a significant threat to life for people living on the sea's shore. 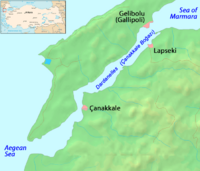 They are based on different theories about the level the freshwater lake had reached by the time the Mediterranean Sea was high enough to flow over the Dardanelles and the Bosporus. On the other hand, a study of the sea floor on the Aegean side shows that in the eighth millennium B.C.E., there was a large flow of fresh water out of the Black Sea. In a series of expeditions, a team of marine archaeologists led by Robert Ballard identified what appeared to be ancient shorelines, freshwater snail shells, drowned river valleys, tool-worked timbers, and man-made structures in roughly 300 feet (91 m) of water off the Black Sea coast of modern Turkey. Radiocarbon dating of freshwater mollusk remains indicated an age of about seven thousand years. In 1997, William Ryan and Walter Pitman, geologists from Columbia University, published a theory that a massive flood through the Bosporus occurred in ancient times. They claim that the Black and Caspian Seas were vast freshwater lakes, but then about 5600 B.C.E., the Mediterranean spilled over a rocky sill at the Bosporus, creating the current communication between the Black and Mediterranean Seas. Subsequent work has been done both to support and to discredit this theory, and archaeologists still debate it. This has led some to associate this catastrophe with prehistoric flood myths. As of 2008, a cross-disciplinary research project funded by UNESCO and the International Union of Geological Sciences continued such research. 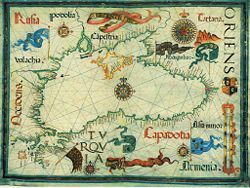 The Black Sea was a busy waterway on the crossroads of the ancient world: The Balkans to the West, the Eurasian steppes to the north, Caucasus and Central Asia to the East, Asia Minor and Mesopotamia to the south, and Greece to the southwest. It is known that the Sea was navigated as early as the time of the ancient Phoenicians. Herodotus, the Greek historian, described the northern coasts of the sea as early as the 5th century B.C.E. The first navigational guides—peripli—were written by Greeks in the fourth century B.C.E. Slavs, Turks, and Genoese settled on the shores of the lake, but by the fifteenth century, the Turks were in control of the entire shoreline. The Black Sea has witnessed the rivalries of Hittites, Carians, Thracians, Greeks, Persians, Scythians, Romans, Byzantines, Goths, Huns, Avars, Bulgars, Slavs, Varangians, Crusaders, Venetians, Genovese, Tatars, Ottomans, and Russians. The oldest processed gold in the world, arguably left by Old Europeans, was found in Varna, and the Black Sea is said to have been sailed by the Argonauts. The Black Sea was a significant naval theatre of World War I and saw both naval and land battles of World War II. Hydrographic explorations of both the Black Sea and the Sea of Azov were undertaken in the 18th century by Russian sailors, being completed by the end of the nineteenth century. Regular meteorological observations were initiated in the first quarter of the nineteenth century, and a biological station at Sevastopol, on the Crimean Peninsula, was founded in 1871. The two-layer exchange of water through the Bosporus was studied in detail in 1881–82, by oceanographer Stepan Osipovich Makarov. 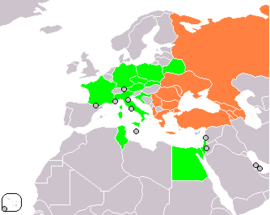 The countries of the Black Sea basin and other regions conducted complex investigations of the Sea in the latter half of the twentieth century. A physical sampling of marine mollusks and extinct freshwater mollusks through underwater archaeological surveys has recently suggested that the inundation of the Black Sea followed the collapse of a natural dam between it and the Mediterranean. Ancient trade routes in the region are being studied extensively by scientists primarily from the United States and Bulgaria. It is widely believed that the Black Sea is packed with archaeologic treasures waiting to be found. Perhaps the most promising areas in deepwater archaeology are the quest for submerged prehistoric settlements in the continental shelf and for ancient shipwrecks in the anoxic zone, which are expected to be exceptionally well preserved due to the absence of oxygen. Oxygen in the Black Sea is dissolved only in the upper levels. There is no oxygen below a depth of about 230 to 330 feet (70 to 100 metres) at the center and 330 to 500 feet (100 to 150 metres) near the edge. These oxygen-free zones support no life other than adapted bacteria. Because of its surface oxygen and the large amounts of nutrients carried into the Sea from the rivers which empty into it, a rich sea life exists in its upper reaches. The Sea contains all the main groups of microorganisms, though most are in a thin surface layer. The Black Sea is home to about 180 species of fish. Approximately one-fifth of them hold commercial importance, the most important being the khamsa, sprat, horse mackerel, and others, including the spiny dogfish, a type of small shark that is especially prolific. 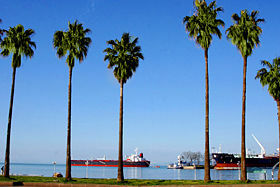 Most of the Sea's plant and animal life derive from the Mediterranean Sea, while in freshwater estuaries and river mouths are found elements of the Caspian. Tiny marine plants of the Black Sea swarming in the water column are grazed on by zooplankton: Protozoans like infusoria and amoebas, small crustaceans, many other marine invertebrates and their larvae. The Black Sea plankton includes some large marine organisms, such as scyphozoan jellyfish and ctenophores. Wading in the shallow sandy bottom are crabs, mollusks and benthic fish, barely discernible, always matching their color to that of bottom: Gobies, flatfish, red and golden-grey mullets, stargazer, pipefish, and others. In very shallow water, are multicolored macroalgae, motley bright blennies, shrimps, and sea anemones. Several species of wrasse live in the dense jungle of brown algae which begins at knee-depth. These include miniature marine snails, small crustaceans and marine worms. Big stone crabs, and the bright red triplefin abide here. Schools of young mullets and horse mackerels sweep over the crowns of the underwater forest. Goat fish, near Romanian coast. Hermit crab, near Romanian coast. Blue sponge, near Romanian coast. Photo of the Black Sea near Gagra, taken in 1915 by Sergei Mikhailovich Prokudin-Gorskii, (1863-1944), a Russian photographer who pioneered color photography. The Sea is subject to severe winter storms, and waterspouts are common in summer. Because it remains ice-free, it is the favored shipping outlet, serving as a transportation artery linking the Eastern European countries with world markets. 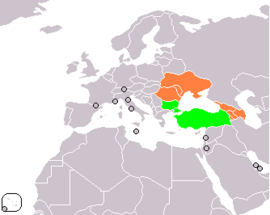 The main port cities are Odessa and Illichivsk (Ukraine); Novorossiysk and Tuapse (Russia); Batumi (Georgia); Varna and Burgas (Bulgaria); Constanta (Romania); Istanbul (Turkey) on the Sea of Marmara. The Danube, which flows into the Black Sea is a huge trade artery for the Balkan countries. Fish is the main biological resource of the Sea. In 1966, the Soviet Union banned dolphin fishing as part of their conservation and antipollution measures. At the same time, restrictions on oil tankers and the disposal of industrial wastes gained stronger regulations. A comprehensive agreement to implement a variety of pollution-control programs, known as the "Convention for the Preservation of the Black Sea," was signed by all six surrounding countries in the 1990s. Additional programs included are designed to sustain fisheries and protect marine life. In the years following the end of the Cold War, the popularity of the Black Sea as a tourist destination has been steadily increasing. Overall, tourism at Black Sea resorts has become one of the region's growth industries. 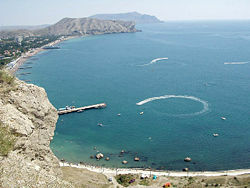 The pleasing climate attracts tourists while the mineral springs serve as a recuperative source, particularly in Crimea. Bulgarian and Romanian beaches have become increasingly popular. ↑ Rüdiger Schmitt, "Considerations on the Name of the Black Sea," in: Hellas und der griechische Osten (Saarbrücken), p. 219–224. ↑ 2.0 2.1 2.2 2.3 2.4 2.5 2.6 2.7 Encyclopædia Britannica Online, Black Sea. Retrieved May 7, 2008. ↑ NASA Earth Observatory, Black Sea Becomes Turquoise. Retrieved May 7, 2008. ↑ R.D. Schuiling, R.B. Cathcart, V. Badescu, D. Isvoranu and E. Pelinovsky, Asteroid impact in the Black Sea. Death by drowning or asphyxiation? Natural Hazards. ↑ New Scientist, May 4, 2002: 13. ↑ Avalon Institute of Applied Science, Black Sea-Mediterranean Corridor during the last 30 ky: Sea level change and human adaptation. Retrieved May 7, 2008. ↑ Chad Parment. Great Shipwreck Museum. Black Sea '01 Expedition. Retrieved May 7, 2008. ↑ 8.0 8.1 8.2 Living Black Sea Marine Environmental Education Program, Black Sea. Retrieved May 7, 2008. ↑ Bulgarian Sea Resorts, The ultimate guide to the Bulgarian Black Sea Coast! Retrieved May 8, 2008. Ascherson, Neal. 1996. Black Sea: The Birthplace of Civilization and Barbarism. London: Vintage. ISBN 9780099593713. Franke, Peter Robert, Wolfgang Leschhorn, Auguste V.B. Miron, and Andrei Miron. 1996. Hellas und der griechische Osten: Studien zur Geschichte und Numismatik der griechischen Welt: Festschrift für Peter Robert Franke zum 70. Geburtstag. Saarbrücken: SDV Saarbrücker Druckerei und Verlag GmbH. ISBN 3930843129. King, Charles. 2004. The Black Sea a History. Oxford: Oxford University Press. ISBN 9780199241613. Öztürk, Özhan. 2005. Karadeniz: ansiklopedik sözlük. Heyemola Yayınları. İstanbul: Heyamola Yayınları. ISBN 9756121009. Ryan, William B.F., and Walter C. Pitman. 2000. Noah's Flood: The New Scientific Discoveries About the Event That Changed History. New York: Simon & Schuster. ISBN 9780684859200. West, S. 2003. "The Most Marvelous of All Seas;" the Greek Encounter with the Euxine. Greece and Rome. 50: 151-167. This page was last modified on 11 June 2016, at 15:58.